Dave Brubeck rehearses with the San Diego Symphony in 1995. Pianist and composer Dave Brubeck, who died Wednesday a day short of his 92nd birthday, has already inspired many remembrances. Most of them will mention "Take Five" — the Paul Desmond composition which Brubeck's quartet made into a huge mainstream hit — as well as "Blue Rondo a la Turk," another standard from the same album. Brubeck never tired of playing those hits. But his creative spirit took him to many other places, both before and since: to throngs of young people, to folk music from around the world, to statements on social justice, to devotional music and into the imaginations of jazz students and new fans everywhere. 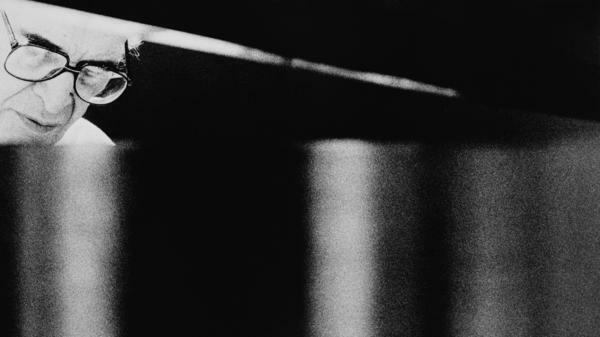 In order to provide a fuller glimpse of the man, here are five more ways to remember Dave Brubeck. College kids have long had a way of deciding what's popular in American music. They certainly did for Dave Brubeck in the early 1950s; his frequent tour stops at universities had a huge hand in making a San Francisco sensation into a national star well before "Take Five" existed. It also helped that his then-new quartet, having picked up alto saxophonist Paul Desmond, quickly developed crafty arrangements of standards and a great bandstand chemistry. It's evident on many live Brubeck quartet recordings from the era, all recommended: Jazz at Oberlin, Jazz at the College of the Pacific (his alma mater), Jazz Goes to College (mostly at the University of Michigan), and so on. Apparently, he even played the University of Rome in 1959; here's "These Foolish Things" from that show. We all know about "Blue Rondo a la Turk," but Brubeck's legacy as a composer extends much further than one song. This is a man who studied with Darius Milhaud, played in a chamber-jazz octet early in his career and is remembered for his odd-meter experiments. Other Brubeck tunes have entered the standard repertoire, too: "It's a Raggy Waltz," "In Your Own Sweet Way" and the piece heard here, "The Duke." First, here's a clip of Brubeck's quartet playing it, followed by the Gil Evans arrangement done for Miles Davis and a large ensemble. At the height of the Cold War, popular jazz artists were often deployed by the U.S. State Department as cultural ambassadors for American creativity. Brubeck was a veteran of such tours, and it showed in his recordings: "Blue Rondo a la Turk" was inspired by folk music he'd heard in Turkey. Being a jazz musician (especially a successful white bandleader who employed a black bassist, Gene Wright), Brubeck was also keenly aware of how racism, both institutional and overt, worked in American society. All this came together when he and his wife, Iola, co-wrote a musical designed for Louis Armstrong — another cultural ambassador, and an outspoken figure on civil rights. Save for one Monterey Jazz Festival performance, The Real Ambassadors was never staged, but it did result in a "soundtrack" recording, with Armstrong, Brubeck's band, singer Carmen McRae and the vocal trio of Lambert, Hendricks and Ross. As "They Say I Look Like God" shows, Brubeck was concerned with a lot more than time signatures. When he disbanded his classic quartet in the late 1960s, Brubeck had more opportunities to explore large-scale compositions. Much of his late career was spent developing pieces for chorus, orchestra, ballet and sometimes jazz combo, often in collaboration with his wife Iola. Several of these works were meditations on social justice; some overlapped with his interest in writing sacred music, including a Mass. Here's an excerpt from The Light in the Wilderness, an oratorio which was originally titled "The Temptations and Teachings of Christ." To listen to Neda Ulaby's appreciation of Dave Brubeck's life and career, as heard on All Things Considered, click the audio link. 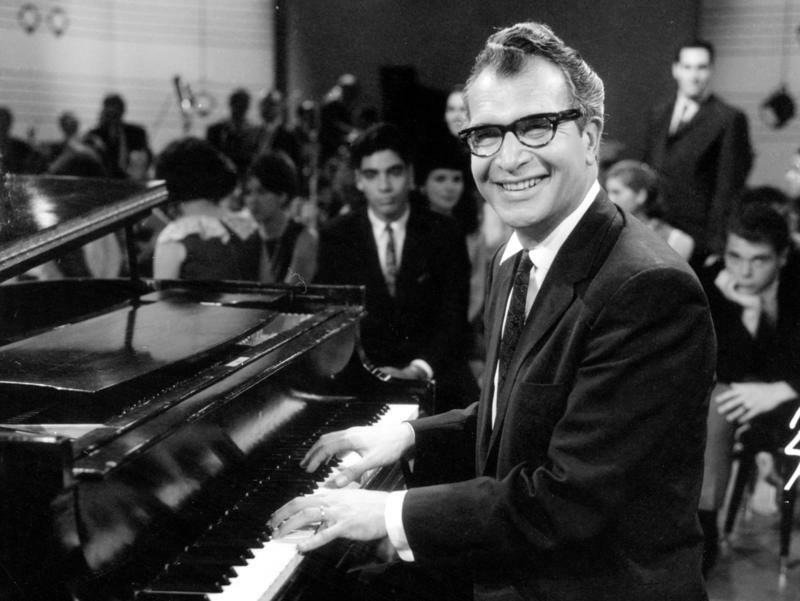 For millions of Americans who came of age in the 1950s, Dave Brubeck was jazz. His performances on college campuses, Top 40 radio play, his role as a jazz ambassador for the U.S., his picture on the cover of Time magazine — all made him one of the most recognized and recognizable musicians of the era. He died Wednesday morning, the day before his 92nd birthday, in Norwalk, Conn. The cause was heart failure.